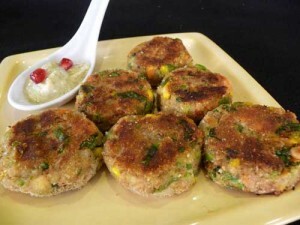 Aloo Kay Cutlets recipe by Roohi at DesiRecipes.com. First of all boil the potatoes and then peel them and mash them good. In a sperate pan fry the peas with salt and red peppers. After the peas are softened, add all the ingredients in it. Now make little balls out of the potatoes and in the middle put the mixture of peas. after making the kababs put them aside. When ready to serve, beat an egg with salt and pepper in it. Now 1 by 1 take the kababs and dip them in the egg. After that roll them in bread crumbs and fry them. After frying them leave them in a plate on top of napkins so the oil is absorbed. And now serve them with green chutni. There are 10 comment(s) for this recipe. yes i have made it & its brilliant..!!!!!!!!! I try it i feel that i make it very easily to see this recepie. thanks to help me.